Everyone has people on their gift list who are tough to buy for. Maybe there's somebody who has everything, and doesn't need more "stuff." Does Mom really need another vase or scarf? This year, think about the gift that won't sit around gathering dust! Give the gift of learning a new cooking technique, meeting fellow food enthusiasts or tasting a wine from a specific region of France. 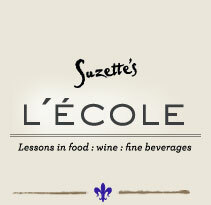 A class at Suzette's L'École is an escape to an exotic destination for a few hours one night: what's not to love!? To purchase a gift for your loved one, friend, teacher or coach, simply call us at 630.462.0898, and we will be happy to help you. We have an elegant, full-color gift card and envelope that will announce your thoughtful gift in style (see photo to the right.) 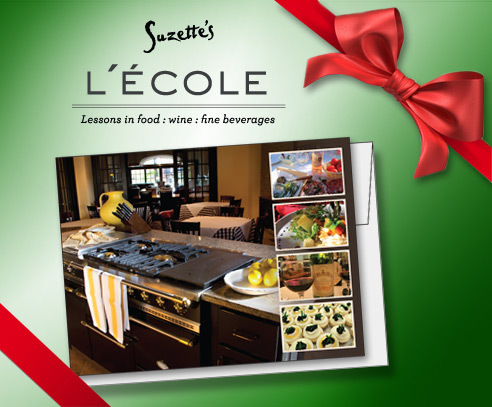 A class at Suzette's L'École will create lasting memories for the special people in your life!